On the morning of July 26, 2016, two 19-year-old Islamic State radicals, Adel Kermiche and Abdel Malik Petitjean, burst into Father Hamel’s church in Saint-Etienne-du-Rouvray shouting “Allahu Akbar!” They seized the priest who was celebrating Mass, along with 5 other members of the congregation. Cardinal Angelo Becciu, the head of the department that oversees sainthood, greeted Lebrun and his delegation Wednesday, and received the six heavy boxes filled with papers on Hamel, fruit of a two-year investigation into the details of the priest’s life, final hours, and death. Hamel’s case is a “priority” for Pope Francis, the cardinal said, and will get special attention among the 1,500 causes currently under review. The sainthood cause was officially opened at the diocesan level in April 2017, after Pope Francis waived the mandatory five-year waiting period. The pope himself declared the murdered French priest to be a Christian “martyr” in September 2016, which — if confirmed — would automatically make the person a saint in the Church’s eyes. 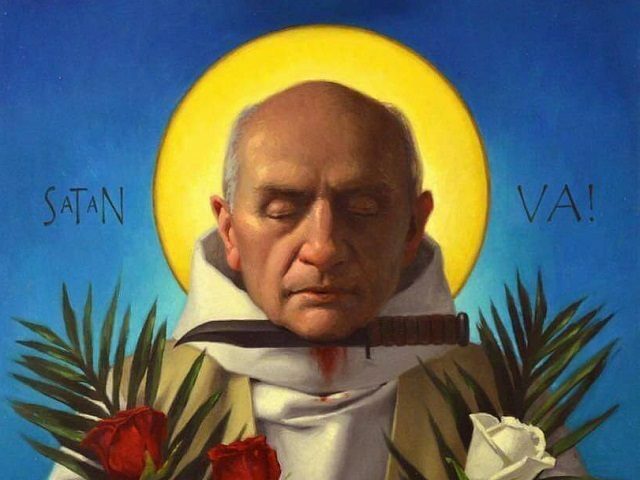 While not formally canonizing Hamel, the pope said then that the French priest is in heaven, noting that “all martyrs are blessed (beati),” a technical term the Catholic Church uses for those who have been “beatified” or declared to be with God in heaven. “You can put this photo in the church, because he is blessed now, and if someone tells you that you do not have the right, tell them that the pope gave you permission,” Francis told the archbishop of Rouen, referring to a photo of the deceased priest that Francis had signed.